incy-wincy-man - A mummy's inane blabberings.. The class was almost over when I got there as the kids have all submitted their art of the day..Aidan was happy with his car painting and had left it by the wall to dry. But he still wasn't satisfied and wanted to draw more. So the teacher asked him what he had in mind. "Spiderman!" the boy exclaimed! Yes, that's his hero of the moment ever since his grandparents gave him a spiderman VCD. "Easypeasy! ", said his teacher. "Draw a small circle and then a bigger one below that circle". The boy listened and followed her instructions accordingly. "Then draw two triangles in the small circle and then do criss-crosses on both circles!". 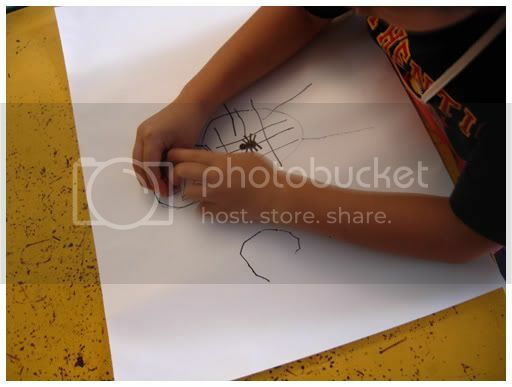 She helped him draw a little spider on the torso and asked him to pick the color himself. Aidan selected the red crayon and filled in the color on his own..He was so delighted with his completed masterpiece and went about showing it off to everyone in class. And also to the cashier at the supermarket and the lady who shared the lift with us...He can't wait for his daddy to come home so that he can show it to him too! This is his car painting! Check out his mega huge front tyre! holding on carefully to his spiderman art on the way home..
wow...the car painting is impressive!! 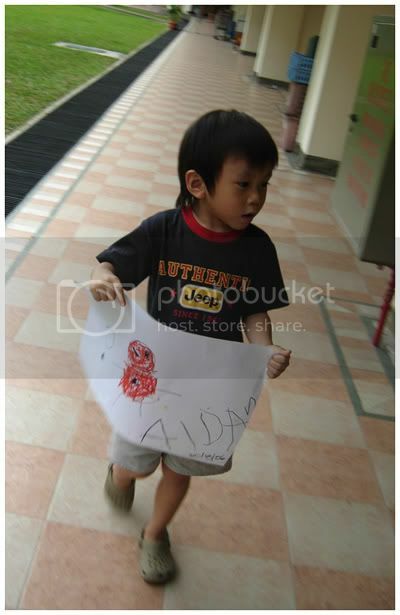 :) well done, Aidan!! Spiderman ROCKS! :) lovely..and that car...way cool, the colour combi! heh..i think that spider on the torso sorta gave it away, duncha think? one improvement i noted was that he gave spiderman arms. That was one thing he forgot when he drew us a while back..
heh..okay lah. 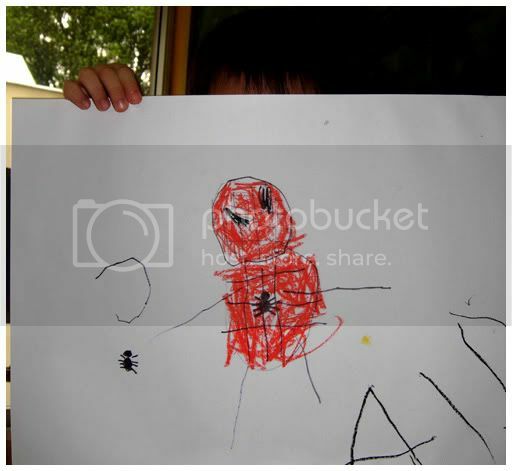 ive seen more fab stuff done by other kids but im still v proud of his spiderman coz i saw him draw it! i like the spidy! haha that's my favorite superhero!! i am impressed with BOTH the drawings! 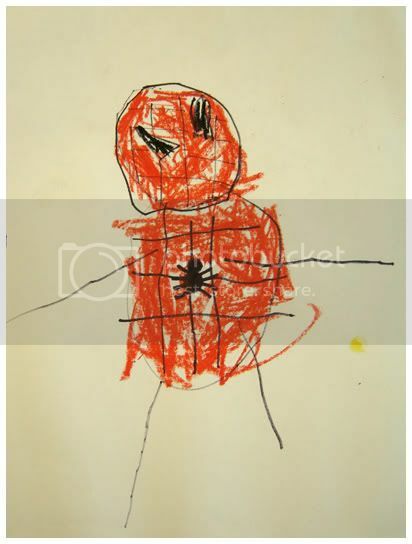 he also learnt how to draw the spider himself is it? the one on the side! hehehe..let's see if you can feel it all the way from japan..
enjoy yourself there babe!! RELAC!!!! this is the reason why i think every child should have art classes when they are young! (can't stand those parents who only put their children thru tuition/abacus/those-mind-stuff and not art classes!) even music classes, some parents have sub-motives for them. 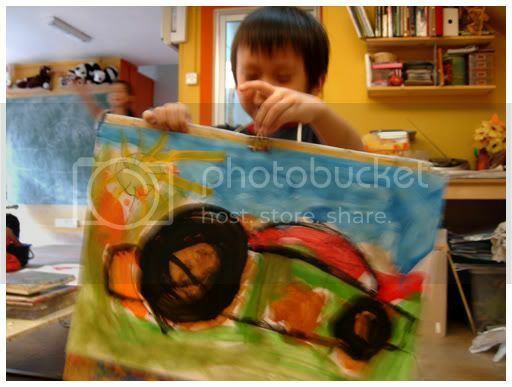 art cultivates the kid in a totally different aspect and you never know their giftings until they explore them! you rock, mummy! hmm, to be fair..some kids actually do enjoy those other enrichment classes, especially music. unfortunately, because the education system is getting tougher, parents see the need to give the kids an edge even before primary one level. my colleague's son who is going to be in pr 1 next year has already been advised by his kindergarten teacher to get some chinese tuition or he'll be at a disadvantage in school. sometimes, parents can't help but be pressurized into doing so..
im letting aidan take art lessons because if not, he'll be either watching tv or messing ard with my pc..:) and it's only once a week! cool. love both the painting and sipderman. maybe aidan can draw a mountain-water drawing for your dinning room. oi, remember to call me when you are at sph..have a drink before your session. That's the way I draw Spiderman too LOL! I seriously think he has a very good sense of colour co-ordination, look at the lovely shades in the car painting! you know, i dont think i can even draw spiderman if i hadnt listened to the teacher today.. I hope to bump into you in the estate one day! I love going to the supermarket there. Pricey but everything is neat and the uncle is very nice! you there during the weekends or evenings? call me leh! feel free to pop by any time!! hehehe... new sleeky template wor... nice nice nice!!! yeah, it was a learning experience for me too :).